Temple (Owls, 27,803 students, Philadelphia, PA) 78, #5 DUKE 73 – Fundamental basketball truth: If you shoot 56% you win damn near every game. And, that is exactly what Temple did. Khalif Wyatt scored 22 points and Rahlir Hollis-Jefferson had 17 to help the Owls knock off No. 5 Duke. Using tough man-to-man defense that limited Duke's long-range shots, the Owls (10-3) grabbed the lead midway through the first half and never let it go. When the Blue Devils (12-2) crept within three points in the waning minutes, Wyatt hit consecutive 3-pointers for a 66-57 lead. The Owls had lost nine straight times to Duke, and hadn't beat the Blue Devils since Jan. 25, 1996. This decisive win in front of more than 20,000 fans gave the Owls wins over Top 10 teams for the fourth straight season, all in Philadelphia. Miles Plumlee scored 17 points, while Mason Plumlee had 16 points and 13 rebounds for the Blue Devils. FLORIDA STATE 85, Auburn (Tigers, 20,446 students, Auburn, AL) 56 – Looking to avoid its third consecutive loss and looking for answers, the Florida State blasted Auburn 85-56 at the Donald L. Tucker to end their two-game skid and effectively erase the memory of what transpired less than a week prior. FSU (9-5) needed three extra periods to reach 75 points in the loss to Princeton and scored just 10 points by halftime in that game. But against the Tigers (10-4), the 'Noles didn't have that same difficulty scoring the basketball and scored a season high. Paced by Michael Snaer's career high 22 points, Florida State built a 50-16 lead at halftime and were never tested by the previously untested Tigers in the second period. N.C. STATE 78, Delaware State (Hornets, 4,179 students, Dover, DE) 44 – Scott Wood and C.J. Leslie shared leading scorer honors with 14 a piece, but Richard Howell’s 12 point, 12 rebound performance took center stage. Howell notched double-digit rebounds for the fifth-straight game, and the Pack improves to 6-0 this season when the junior captures 10 or more boards. Wood’s 14 came on 5-of-12 shooting (4-of-11 from beyond the arc), while Leslie went 6-of-12 and snagged eight rebounds. 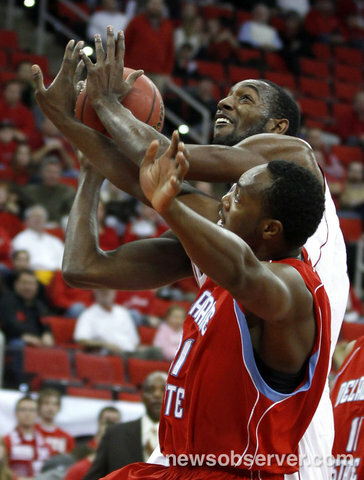 Delaware State broke an over seven-minute long scoreless streak early in the second half before NC State cruised on an 18-6 run from the 17-minute mark to less than nine minutes remaining. The run culminated with the Pack holding a 64-30 advantage with 9:02 remaining.